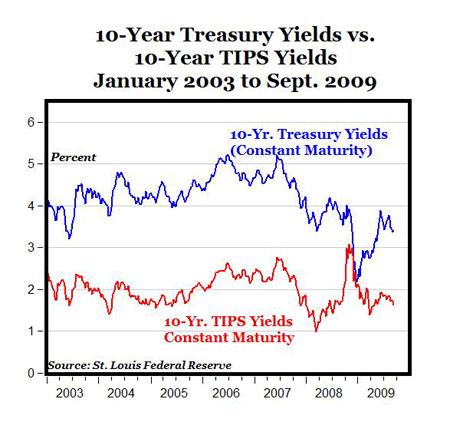 The top chart shows the weekly, bond market-based 10-year TIPS-derived expected inflation back to 2003, calculated as the difference between 10-year regular, nominal Treasury yields and 10-year Treasury inflation-indexed yields (measure of the real interest rate), both on a constant maturity basis (St. Louis Fed data here for 10-year TIPS and here for regular 10-year Treasuries); see the bottom chart for those yields graphed separately. 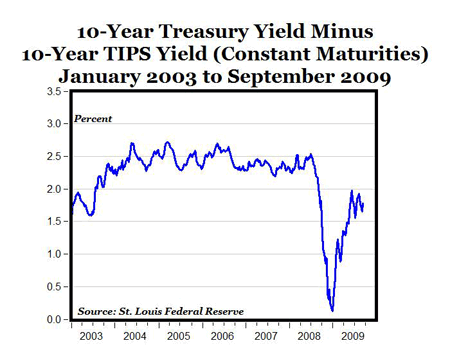 After an unusual period in late 2008 resulting in a narrowing spread when the TIPS 10-year yields were unusually high and approaching 3%, and regular Treasury yields were unusually low and approaching 2%, the Treasury market seems to have stabilized, and the bond market’s 10-year expectation of inflation is now around 1.75%, lower than the inflationary expectations from 2003-2007 of around 2.5%. Many analysts and economists seem to be worried about future inflation, resulting from the easy Fed monetary policy in 2008. Why doesn’t the bond mark share those concerns? According to the inflationary expectations derived from the bond market, future inflation is less of concern now in 2009 than it was in 2007 before the increase in liquidity. What gives?